MYOB and LEAP have joined forces, allowing you to manage your law firm from the cloud. LEAP’s cloud-based product integrates with the cloud based version of MYOB AccountRight so you can work anywhere, collaborate online with your team, and manage legal accounting solutions for clients, along with managing your BAS, payroll. All your finances and business information are up to date and in one place, available when and where you want. With LEAP and MYOB, you can manage your legal accounting requirements and your office accounting so you are set up for success. Access LEAP and MYOB AccountRight online, giving you the convenience to work when and where you want. 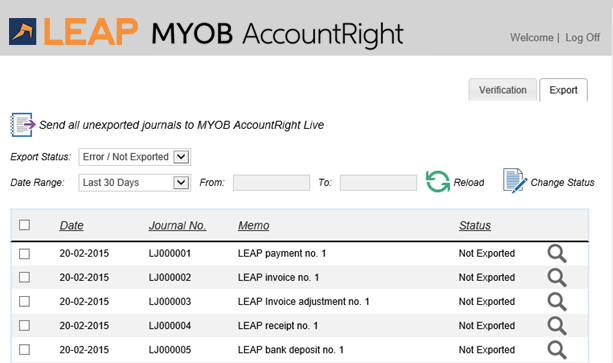 LEAP integrates with MYOB AccountRight through LEAP General Ledger Link. This allows any Office Accounting transaction journals generated within LEAP in the cloud to be exported seamlessly into MYOB AccountRight. Once set up, the bank feeds feature in the MYOB AccountRight allows users to link their bank account to save time on data entry and bank reconciliations. A range of other smart features help securely store bills, take payments and make compliance easier. Convert - this the existing LEAP Office data would be converted to a LEAP cloud data file. To get started, contact the LEAP Conversions team on 1800 007 709 to discuss their conversion path. Transfer - this means you would leave behind your historical LEAP Office data and start afresh with a new data file within LEAP in the cloud. For information about AccountRight contact us on 1300 720 931 or email leaplegal@myob.com to access the special LEAP discounted pricing.